For patients with low levels of mobility, the use of a pressure relief cushion may be recommended to reduce their risk of developing pressure sores. The Harvest Modular Foam Pressure Relief Cushion is designed to provide significant levels of pressure reduction combined with maximum stability and comfort. 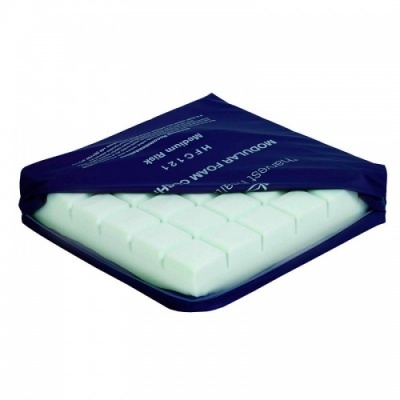 It is a general use pressure relief cushion, ideal for patients at a medium risk of developing pressure sores. This cushion is available in two different sizes; select the size appropriate for you from the drop-down menu above. The foam used throughout this pressure relief cushion has been castellated, so as to provide equal levels of pressure relief to all areas in contact with it. This castellation allows pressure to be evenly dispersed along the cushion and also allows for greater breathability. The breathability of the foam and castellated layout lets air pass through all parts of the cushion, preventing the user from overheating and perspiring. 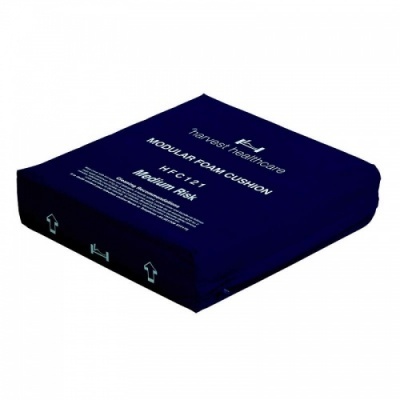 The Modular Foam Pressure Relief Cushion is supplied with a fully fitted vapour permeable two-way stretch cover, enabling the product to breathe and enhancing the qualities of the foam itself. The cover is also waterproof, guarding against damage from any spillages or fluids.